(4) A BBO crystal for Type I sum frequency mixing to generate the THG. The configuration of the crystals for THG is presented under the "Tech Info" tab. 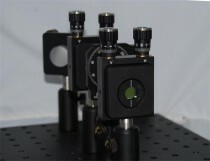 The aperture of the crystals can be 5 to 15mm to be compatible with a specific laser. Extensions with harmonic separators, waveplate/polarizer power adjuster, or opto-mechanics are available upon request. The selection of the THG kit is highly dependent on the fundamental laser. Please send us an inquiry with your laser parameters, i.e. the central wavelength, pulse energy, repetition rate, and the beam size if you need an assistance. Type II THG kits are also available. There is no need of the dual waveplate for Type II THG. However, the efficiency of Type II THG is in general lower than that of Type I.